“From the Civil War to our combustible present, acclaimed historian Carol Anderson reframes our continuing conversation about race, chronicling the powerful forces opposed to black progress in America. 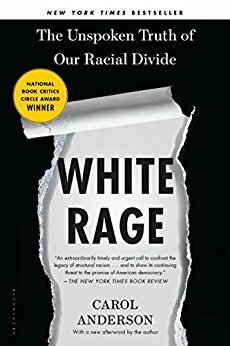 Since 1865 and the passage of the Thirteenth Amendment, every time African Americans have made advances towards full participation in our democracy, white reaction has fueled a deliberate and relentless rollback of their gains. The end of the Civil War and Reconstruction was greeted with the Black Codes and Jim Crow; the Supreme Court’s landmark 1954 Brown v. Board of Education decision was met with the shutting down of public schools throughout the South while taxpayer dollars financed segregated white private schools; the Civil Rights Act of 1964 and Voting Rights Act of 1965 triggered a coded but powerful response, the so-called Southern Strategy and the War on Drugs that disenfranchised millions of African Americans while propelling presidents Nixon and Reagan into the White House, and then the election of America’s first black President, led to the expression of white rage that has been as relentless as it has been brutal.